For the early part of the Beach Boys career, singles were beginning to be widely issued in both mono and stereo formats. Yet in those days, hits were made on AM radio in mono. And the mono of those times worked well for Wilson, who suffers from partial deafness. In fact, for their first 13 albums, Wilson originally turned in all the final mixed Beach Boy albums to Capitol Records only in mono. The mono mixes were where Wilson paid intense attention, and the dedication paid off! Still, there’s no disputing that the close harmonies and one-of-a-kind rhythms of hits like “Surfer Girl,” “In My Room,” “Little Deuce Coupe” and more lend themseleves naturally to stereo. So we’ve got your 2-channel needs covered with prime stereo mix versions as well. The stereo editions of Surfin' USA, Surfer Girl, Little Deuce Coupe, Shut Down Vol. 2, All Summer Long, Beach Boys Christmas Album and Beach Boys Concert were all mixed in stereo by their own preferred engineer, Chuck Britz, ostensibly under the group's supervision. "Brian may or may not have been present for those mixing sessions — evidence suggests that he trusted Chuck's skills enough to let him prepare those mixes on his own - but the group held onto their multitrack tapes and delivered stereo masters to Capitol, rather than allowing Capitol to prepare their own stereo versions. Later, when Brian was only delivering mono masters, Capitol would prepare the Duophonic pseudo stereo editions for the stereo market," says Alan Boyd, producer and Beach Boys' archivist. The Beach Boys' practice of double-tracking their vocals really lends itself to stereo mixes. Split left and right, as they are on a lot of those early stereo versions, those doubled vocal parts can really envelop the listener, surrounding them with Wilsons, Loves and Jardines! 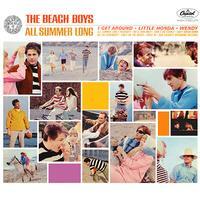 All of the newer stereo mixes on these remastered albums (The Beach Boys Today!, Summer Days (And Summer Nights!! ), The Beach Boys' Party, Pet Sounds and Smiley Smile) were done by Mark Linett on behalf of the Beach Boys. (2 Stars) 2 person(s) rated this product.